Comments: The sequel to Israeli Air Force. Having enjoyed Israeli Air Force, I had high hopes for USAF and I wasn't disappointed. It actually runs faster and it's a quantum leap in the looks department! 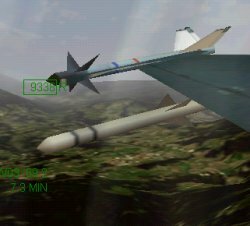 Looking right in the F-16 you can see an AIM-9 Sidewinder then inboard an AIM-120 AMRAAM. What is a MiG ?